The way that Raymie imagined her plan unfolding was that her father would be sitting in some restaurant, in whatever town he had run away to. He would be with Lee Ann Dickerson, the dental hygienist. They would be sitting together in a booth, and her father would be smoking a cigarette and drinking coffee, and Lee Ann would be doing something stupid and inappropriate, like maybe filing her nails (which you should never do in public). At some point, Raymie’s father would put out his cigarette and open the paper and clear his throat and say, “Let’s see what we can see here,” and what he would see would be Raymie’s picture. Expect the unexpected with award-winning author Kate DiCamillo’s new tale. Raymie Clark is a ten-year-old girl with a big imagination. She has known for two long days that her dad has snuck off from her mum for another woman. Raymie has constructed a plan; to win the Little Miss Central Florida Tire competition. She believes her father will discover her fame and be so proud that he will come home. With brave Beverly Tapinski and bunny clip-wearing Louisiana Elephante, Raymie strives to get her dad back. While this narrative is written in the third person, Raymie easily shows her thoughts and feelings throughout. I find it really interesting how Raymie is fascinated by Florence Nightingale. She borrowed the book from the school library and didn’t expect to like it because of the miserable back cover. Despite this, Raymie began to enjoy Florence’s tale, reads the story to the elderly as a good deed and is confused by others to share the same surname. Raymie makes a thoughtful and caring lead character and you can feel her desperation for her dad. My favourite character is Beverly. She wants to sabotage the Little Miss Central Florida Tire competition, which is the exact opposite of what Raymie needs. I like her because she is daring. Even though her father is a policeman, Beverly loves picking locks and breaking into buildings. This book is really funny in parts. Louisiana Elephante’s parents were known as the Flying Elephantes, which makes me remember watching Dumbo when I was little. I noticed some similarities between Raymie Nightingale and Kate DiCamillo’s famous The Tale of Desperaux. The language style feels the same. There are characters with traits in common, too; Beverly is brave like Desperaux and Louisiana faints a lot, also like the tiny mouse. On the other hand, Raymie’s story is about friendship and heartbreak while Desperaux’s is about adventure and courage. I give Raymie Nightingale four bookbolts out of five. 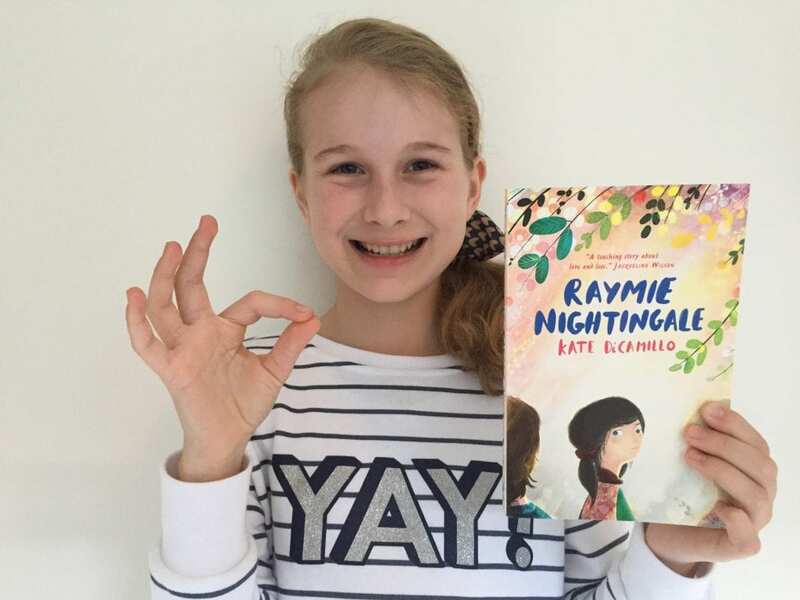 You can read Megan’s thoughts about Raymie Nightingale and other books by Kate DiCamillo here.